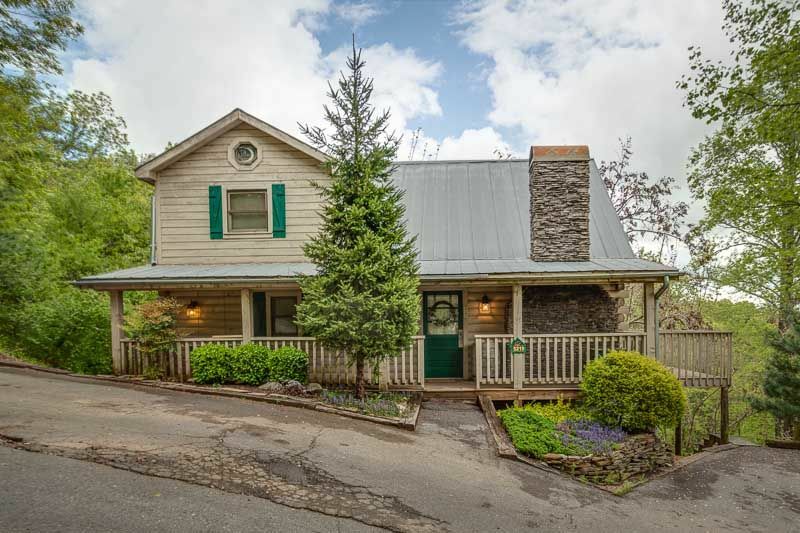 Formerly managed by The Hidden Mountain Resort, this beautiful cozy cabin has been extensively updated and is conveniently located just 10 minutes outside of Pigeon Forge. The open floor-plan features a great room, dining, and kitchen area with 2 master bedrooms, each with a large jacuzzi tub and private bathroom with walk-in shower. There are two gas fireplaces, one in the great room and one in the upper romantic master loft bedroom. The many recent upgrades include: re-finished kitchen cabinets, tile flooring in the kitchen and bathrooms, new carpet, new great room furniture, new bedding, water treatment system, a stainless steel grill and a new hot tub. The kids will love the hot tub and the wooden checkers table on the rear screened porch. In addition to the rear screened porch, there is a side deck overlooking the mountains and tree tops where you can have coffee and watch the wildlife every morning. Mountain views are much better in the Fall and Winter but we do still have a narrower view in Summer There are also always some neighborhood cats that just seem to love our cabin and call the woodlands home. Every year when we make our annual trip there are new kittens. Guests seem to really enjoy the company. You may also see some raccoons or turkeys roaming around the area. Down the hill from our cabin is a beautiful little fishing pond where you can catch and release or just relax and feed the ducks. The front porch has a swing where you can sit and melt the time away listening to the rain pitter patter on the tin roof. Local attractions include Dollywood theme park and water park, Smokey Mountain National Park (with hiking, horseback riding, tubing, and wildlife viewing), Ober Gatlinburg skiing, outlet shopping, and multiple kids attractions and dinner shows. Some of our favorite activities are driving through Cades Cove where wildlife is abundant, and renting a boat on Douglas Lake. Wonderful memories await you. We are a family of 4 now living in Frederick County, MD. Our main home is also a log home. The warmth of a log home is too inviting to deny. We chose this property after viewing many and made our decision based on the view, the decor, and the inviting open floor plan. The cabin has some very large windows overlooking the mountains. The mountains, proximity to attractions, and warmth of the cabin make us look forward to our trip each year. Mountain view is much better in Fall and Winter however there is still a view when there are leaves on the trees. Our stay at cabin 472136 was all we expected and more. The view is spectacular. It was so peaceful and relaxing, just what we needed. We had a couple of minor problems and the owner got back to us immediately. It was clean and comfortable and everything we needed was supplied. Will definitely stay there again and highly recommend it. Anniversary getaway! An amazing time!!!! We absolutely loved this cabin. It was perfect, close to everything, peaceful. Our first time in pigeon forge and we most definitely will come back. The cabin was beautiful & close enough to all of the attractions. We had a lovely, mostly peaceful week in the mountains. We had a great Christmas holiday in this property. The cabin has all the amenities and ensures that you stay without having to run ut for meals or supplies. We only have two suggestions: Replace old rusty pots and pans and also the mattress in the main bedroom will need to be updated. We recommend that you use this property for holiday and vacation stays since it offers the perfect location and scenery to have a very peaceful and joyful stay. The owner was super nice and helpful. We will definitely be back. We will require some sort of damage protection. You can either purchase an damage protection policy for $59 that will cover up to $1500 in damages or you could choose to give a $200 refundable security deposit. The choice will be yours. No Smoking in the cabin please- Smoking is allowed outdoors on the decks.